With the impending launch of the Galaxy Note 5 in September sending the users in the market on a tizzy; the word on the block is that the Galaxy Note 5 phablet may consist of a unique feature for its S Pen Stylus- the Auto Eject. This feature implies that the Galaxy Note 5 users will no longer have to manually bring out the S Pen but it will be ejected automatically by the Smartphone instead. The USPTO Patent caught the attention of Patently Mobile, and it’s been reported that the novel auto-eject mechanism will be functional with the help of magnets. The S Pen has been one of the major attractions of the Samsung Galaxy series and with the Note 5, the silicon giants from Korea plans to upgrade user experience with the S Pen to a whole new level. Samsung intends to use the properties of magnetism in a controlled manner to keep the pen locked when not being utilized. However, with reverse polarity coming into play, the device will eject on its own when the time comes for scribbling. Furthermore, the magnetic marvel will also include voice-based stylus ejection properties which will enable you to furbish your S Pen as the real world alternative of a magic wand! However, the wonders of the New Galaxy Note 5 just do not end there. The Note 5’s structural design would be in sync with its earlier versions which have helped it reap rich dividends in the market. Its metallic, all aluminum body brings about a matured and premium outlook to the model. Samsung has furthermore gone all out with the display of the Note 5 which is rumored to house a 5.9 inch AMOLED screen which will support resolutions upto 4k. It will also include a Quad HD Screen that will have a density of 600 pixels and above. With the addition of the Exynos 7420 chipset, the Galaxy Note 5 is expected to be packed with greater processing power. The chipset would reportedly be clocked at 2.9 GHz. Furthermore, a 4-6 GB of RAM space with an expandable memory of 128 GB clearly indicates how big the latest product from the Samsung Galaxy series is going to be. It is highly anticipated that the Note 5 would feature 4100 mah batteries and will come preloaded with the latest version of Android OS, most likely Lollipop 5.0 and high end security features like fingerprint scanners and in-built Knox security solutions. 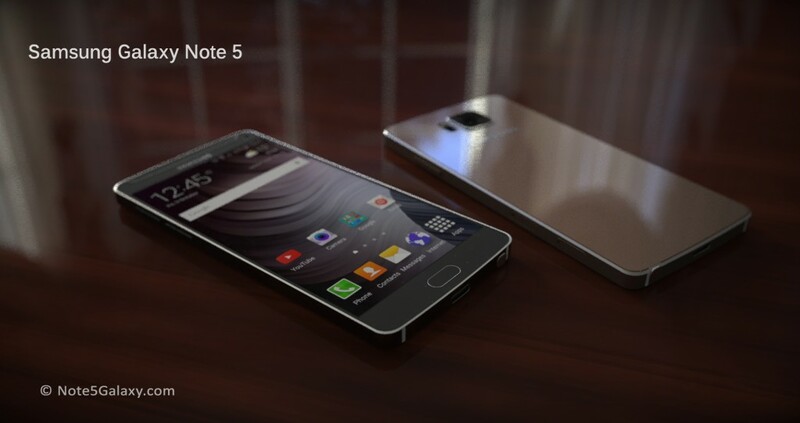 The conceptualized design has been put into crystal clear images at Note5Galaxy.com, don’t forget to check out. With the addition of novel features such as the auto ejecting stylus, the Galaxy Note 5 is set to obliterate any competition it might face in the market and emerge as the first preference for phablet users across the world, putting Samsung rightfully at the top.